Amy's Day Spa | Spa Cuisine Recipe: Maple Sweet Potatoes to Boost Your Health! Spa Cuisine Recipe: Maple Sweet Potatoes to Boost Your Health! They contain carotenoids which are super cancer fighting agents. 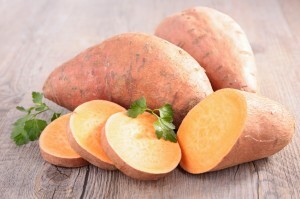 We can increase the carotenoid absorption in our body by adding a bit of fat to the sweet potatoes. 1. In a medium saucepan cook potatoes, covered, in a small amount of boiling water for 30 to 35 minutes or until very tender; drain. 2. Mash with a potato masher then beat with an electric mixer on low speed. 3. Add maple syrup, butter, and salt. 4. Gradually beat in enough milk to make potato mixture light and fluffy.